Team Nimrod - SYH to Ostend – in March! 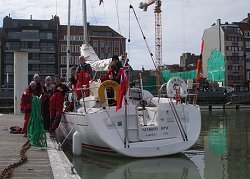 Nimrod and eight of her more (fool)hardy crew members sailed to Ostend and back over the Easter weekend, the boat's first trip abroad and the first passage of 2005 for all on board. Our enthusiasm for getting some proper miles under the hull was cooled by the fact that it was still March, but following some almost obsessive monitoring of the weather forecasts during the preceding week it was decided that the trip could go ahead as planned. In LV 87 the weekend before, our efforts at recruiting companion boats for the passage met with measured teeth-sucking and regretful but unconvincing explanations that obviously I am very keen but my wife/husband would rather just quietly potter up the Stour. And so it was that just before midnight the following Thursday evening Nimrod nosed out of SYH alone, in bright moonlight and a gentle but sailable breeze. The decision to set off in the middle of the night was a consequence of tidal conditions, a general impatience to get out on the water as soon as possible given the fact that we had only a long weekend to get there and back, and a need to grab windows of clear weather where possible: localised fog had been forecast for parts of the North Sea, and we were keen to avoid this where possible. Unfortunately, our efforts in this direction were thwarted as visibility gradually worsened, and by 4am we had lost sight of the moon and Nimrod pressed on bathed in a damp grey-blue glow. Through all this the wind held up, however, and except for a precautionary spell of motoring as we crossed the shipping lanes the journey was completed under sail. It was only in the approach to Ostend early on Friday afternoon that the fog lifted, which turned out to be something of a godsend. When we called up port control we were greeted initially by silence, then eventually by a voice informing us that the port control was on strike and to "enter at your own peril". Ferryways and the other companies operating out of the port were doing a fine job of co-ordinating their movements without any land-based assistance, and we found a gap in the traffic with little difficulty; but it would have been another matter to bring Nimrod in with the additional factor of fog to take into account. Ostend is a favoured haunt of the Nimrod crew, though at first sight it is not easy to see why: the sparse town centre has only a few good bars and restaurants to tempt the visiting yachtsman, and the front is unsightly with its blocks of flats and characterless sea wall. The Europa Centre brings the credibility of the town planners further into question - though if it was built to be a visual reference for approaching boats (a job which it fulfils excellently), then all is forgiven. To the town's credit, the beach is clean and amply proportioned for cricket matches, and the people are friendly and hospitable. This latter trait was exemplified on our arrival by the havenmeester of the Royal North Sea Yacht Club, whose charismatic and somewhat cynical take on life, combined with his uncanny English wide-boy accent, was a source of much amusement to the bleary-eyed crew. He was pleased to see us, too, as we were only his third visiting boat of the season (we had the marina to ourselves for much of the stay); and it seems that what is expected of groups of young English visitors arriving in Ostend by boat after a chilly 14-hour crossing is the same as that expected of those arriving in Majorca by plane after a beer-soaked 2-hour flight. Fortunately, on this occasion our entourage was lent a hint of respectability by the presence of the boat's venerable owner, but on previous jaunts around the Low Countries it was common for Dutch or Belgian yachtsmen to stroll up to our boat of a morning and exclaim with a broad grin "Hallo boys! How are the hangovers?". The very sight of four young males entering a marina in sole command of a yacht had been known to cause the owners of neighbouring boats (without any justification I must add) to adopt an _expression of alarm and scramble down below to locate additional fenders and dig out earplugs for what to their mind was sure to be a night of disturbed sleep. Friday night was spent engaging in good clean fun with the youth of Ostend, and a fog-enveloped Saturday saw us broadening our cultural experience of the town with some sport on the beach and a coffee or two on Wapenplein. We would have had some waffles, but it appears that there is a byelaw stipulating that these may only be served during a three-hour period in the afternoon, and if, as we did, one finds oneself hungry at lunchtime one has to settle for apple pie or a croque monsieur. As dusk descended upon us we enjoyed some card games back on board, the dehumidifier working flat out to combat the fog which was condensing on any cold surface both outside and inside the boat. Up to this point we had been only seven, the eighth member of the crew joining us late on Saturday evening by train from the ski resorts of France. His arrival coincided with a period of clear skies and good visibility, and, somewhat to his dismay (it had been a tiring week of apres-ski), it was decided again to take immediate advantage of this improvement in the weather and press on back to the UK, the intention being to arrive in Lowestoft at some point on Sunday and head down to Levington on Monday. The return leg started off in very similar conditions to those in which we left Levington two days before, the light breeze on this occasion being in the east and far enough astern for us to put up the large spinnaker in a bid to eke out an extra knot or two. This quickly came down when the wind swung round to the north and started to build, and within a few hours it had built to a good force 4 on a close reach, strong enough to necessitate a single reef for the comfort of the helm and those attempting to sleep downstairs. The wind continued to fluctuate both in strength and direction, and as it swung further to the north the chances of making it to Lowestoft in a straight line were looking increasingly slim. It was decided therefore to head straight back towards Felixstowe, with the expectation of settling for a training session on Monday in advance of the upcoming club racing. With the northerly wind the fog also rolled in, and again as on the outbound journey we found ourselves enclosed with just a few yards of sea visible around the boat. Frequent foghorns tracking around us reminded us that this remained a highly active area for shipping, and occasional dark shapes materialised close by, looking still more imposing with the top half of their superstructure lost in the mist. A diligent watch was kept throughout, and Nimrod arrived safe and sound in her berth some 15 hours after her departure from Ostend, the crew grateful for a chance to allow their kit to dry but otherwise in fine shape. Certainly there were no regrets at having made the crossing so early in the year: by the end of March the hours of daylight are already respectable, and, provided a suitable weekend is chosen, the weather can be more than tolerable for an extended spell at sea. For those itching to get back on the water after a long winter, this was just the answer.